I have to go on a small rant about Finnish bus drivers. Well, I should say bus drivers in Finland, because they aren't all Finnish nationality, but that is beside the point. Actually, the best experience I have had so far was with a Tunisian bus driver, but I will get to that later. Finnish bus drivers are nothing at all like those that I have experienced elsewhere. 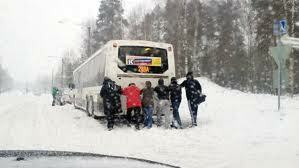 In Finland bus drivers always have the right of way. That means that when they turn on their turn signal to leave the bus stop to enter back onto the street, they just proceed to drive without looking. They do not care if you are passing them at the same moment or not, they will ram into you. They have absolutely no regard in waiting for a car to pass them, they just think they own the road and that you should get out of the way. I have had countless experiences of driving on the freeway when a bus comes onto the freeway and instead of nicely merging into the lane, just decides to cut me off as I quickly speed up and exit the lane before getting pummeled. 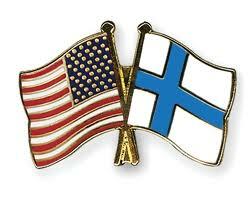 I am really scratching my head on why it is this way in Finland. I am pretty sure that if a bus in the United States needs to turn back onto the main road, they will wait until no cars are passing and deem it safe before turning back into the traffic lane. Also, when I board Finnish buses I normally say "Paivaa" "Heippa" "Terve" or another Finnish greeting, but I never get anything back from them, not even a word. They are not friendly or helpful in the slightest way. Also, if I give them anything but exact change for my fare they normally will angrily shake their head at me. I can understand that driving a bus is not the most prestigious of jobs, but a friendly smile and saying hello will go a long way in life. I did want to share one of my few pleasant experiences on the Finnish bus system. I was coming back from Helsinki the other day and had gotten confused on the stop where I had parked my car on the way home. I originally had asked the bus driver if his bus stops at a certain station. When I got off the bus one stop before mine the bus driver actually stopped the bus and opened his door to let me know that I needed to ride one more stop. So, I got back on the bus and he explained to me which stop to get off at and then we chatted for a bit about where he was from, etc. He was originally was Tunisia but had been living in Finland for a long time. I don't want to sound harsh towards Finnish bus drivers, but honestly the few positive experiences that I have had were with expat drivers. I have had many positive experiences since living in this beautiful country, but the bus drivers have not been part of that. I think buses do actually have a legal right of way here, i.e. as soon as they indicate to come out of a stop you are meant to give way to them. I can rant for hours about the terrible level of Finnish driving ("'indicators' Finns! They're called 'indicators' as you are meant to indicate where you are going with them! There's no point using them once you've put your brakes on and made half your turn!!!! :) but oddly as driver and a cyclist, I've never thought the buses were a problem? Perhaps Europeans are just more used to driving around buses than Americans? Thanks for the comments. I think you are correct, they actually have the right of way. However, I think they sometimes abuse that privilege. Sometimes if you are going a certain speed behind them and then they turn on their turn signals last minute, it can be dangerous. The reason being is that it is hard to stop last minute when they don't even wait a second to pull out into the road. So, the way to drive a car here is to use caution and just wait patiently for them to pull in front of you. Yes, I think Europeans are more used to driving around in buses than Americans.